A boffin in Missouri has invented a nuclear-powered battery the size of a penny. Professor Jae Kwon believes that radioisotope batteries can hold a million times as much juice as today's chemical types, perhaps offering the potential for devices like torches and cellphones which would never run flat. The thousand-year cellphone battery takes shape. Radioisotope generators/batteries of the type Kwon is developing are smaller and less complex than a full-blown nuclear reactor. They have, as he says, been used to provide power in spacecraft - typically secret spy satellites in need of more power than solar panels can provide - and also probes sent far from the sun. But these power units have been a lot bigger than a penny. At first sight that would seem to mean cellphones, torches etc, whose batteries would last thousands of years - or the life of the item in question, anyway. 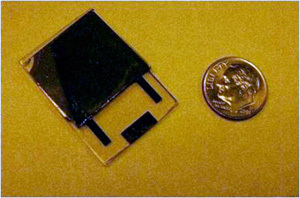 Kwon's special sauce, apart from the teeny size of his battery, is the use of a liquid semiconductor as opposed to the solid-state devices normally used in nuclear battery units. "The hard part of using radioactive decay is that when you harvest the energy, part of that energy goes towards creating defects that damage a solid-state semiconductor," says Kwon's collaborator J David Robertson. "So we created a battery without that part degrading over time." Kwon's focus is on producing extremely tiny batteries for powering so-called Micro Electro Mechanical Systems (MEMS). He thinks that in future his nuclear liquid-semiconductor power units could be made "thinner than a human hair". As for powering gadgets, torches - perhaps even electric cars - such applications would seem out of reach for now. Kwon says that there is "a long way to go" before his battery is ready for commercial marketing. "Not necessarily in terms of a long time, but we have a lot of work before it is ready for industry. At this moment, we're still at the fundamental research level," he said. In particular, he needs to boost the power output of the battery before it can ever be relevant to devices other than MEMS. It currently puts out just 16.2 nano-Watts. One would need a huge pile of such batteries - almost forty million of them - to produce enough power to run a cellphone. Still, assuming that Kwon's right about the potential energy density, that big pile of batteries would power the cellphone for over five thousand years. If the kit scales up in output and down in size as Kwon seems to suggest, a normal-sized phone battery with a life on the order of months would seem possible.